Expressive, participatory liturgy, thoughtful preaching, a blend of new and traditional hymns, and soul-stirring music are some of the elements you can expect to encounter at Spanaway Lutheran Church Sunday by Sunday. We keep time by the seasons of the church year and tune our hearts, minds and spirits to the ever-present NOW of God. Worship leadership is shared by ministers, lay people and musicians, including Cheryl Drewes, Director of Music Ministries , and our dedicated volunteer Music Team and Chancel Choir. For more on the structure and movement of worship, see Worship Nuts and Bolts, here. An organ and piano led liturgical Holy Communion service, featuring a combination of treasured hymns, new and old worship songs, as well as global music. The Chancel Choir sings here regularly, as well as the children's choir, a variety of instrumentalists and soloists. We pull out all the stops: classical, modern, and world music! A casual Holy Communion service featuring the best of contemporary classics, today’s contemporary songs and timeless praise choruses. Worship is lead by our Music Team, comprised of vocals, guitar, piano and drum set. We offer sacramental worship with a beat: timeless, and always in the now! There is an old saying that “One who sings, prays twice.” We welcome and encourage your participation in the church’s song, both by your praise and prayer from the congregation, and by your participation in one (or more) of Spanaway Lutheran’s music ensembles. 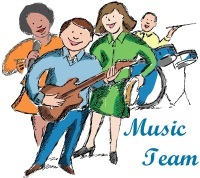 Each opportunity is volunteer oriented, and strives to enrich worship with a diversity of music. Please contact Cheryl Drewes, the Director of Music Ministries, to become involved! 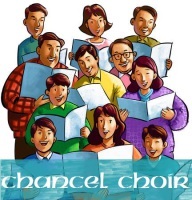 The Chancel Choir sings the rich and varied repertoire that has developed over the centuries on the 1st, 3rd and alternating 5th Sundays of each month. Rehearsals are on Wednesday evenings, from 7:00-8:15 p.m. The Music Team explores the vibrant contemporary Christian music scene and leads worship on the 2nd, 4th and alternating 5th Sundays of each month. Rehearsals are on the prior Tuesdays, from 6:30-8:00 p.m. The Christmas and Easter Orchestra enhances festival worship with custom arrangements of congregational song. Rehearsals are on the three Sundays leading up to the festival service, from 11:30-12: 15 p.m. The Children’s Choir sings in worship about once a month. At rehearsal, kids are nurtured in faith and community as they explore engaging music which often uses chimes, xylophone, and other percussion. Rehearsals are on Wednesdays, from 5:00-5:45 p.m.